Quarterback Aaron Rodgers walks off the field after the Packers lost the wild-card playoff game to the San Francisco 49ers. 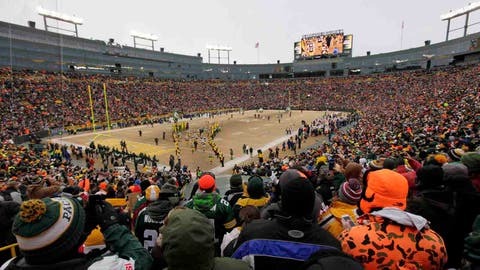 GREEN BAY, Wis. — Different season, different teams (at least that’s what the coaches claim to believe), same result. 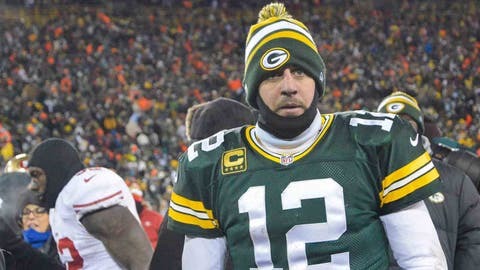 For the second consecutive year, the Green Bay Packers had their season ended by the San Francisco 49ers. Though Sunday’s 23-20 outcome was significantly closer than the 45-31 blowout from a year ago, the Packers continue to fall short of the 49ers. "It hurts," coach Mike McCarthy said of losing to San Francisco again. "Yeah, it hurts." The playoff rematch, this time at Lambeau Field, didn’t have one team clearly dominating the other. This wasn’t like last year, when Colin Kaepernick’s 181 rushing yards overwhelmed Green Bay. This time around, two of the NFC’s better teams traded blows and exchanged leads five times. Yet, as the teams shook hands at midfield after the game, it was once again the 49ers advancing in the postseason and the Packers getting ready to clean out their lockers and begin their offseason. "We just came up short," veteran defensive lineman Ryan Pickett said. "It’s nothing about them. There’s nothing that shocked us that they did. We know them, they know us. They’ve just been able to come out on top the last couple times." It’s the two playoff meetings that meant the most, but Green Bay also lost to San Francisco in Week 1 this season, making this the third time in the past calendar year that the 49ers have topped the Packers. "It’s tough; losing to them four straight times now, it’s frustrating," said offensive linemen Josh Sitton, who was including a 2012 Week 1 defeat when Alex Smith was still San Francisco’s quarterback. "It’s definitely not fun." It was bleak for Green Bay early on in Sunday’s game. 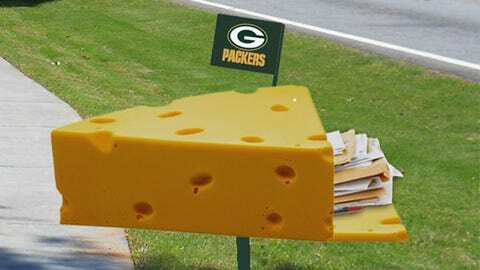 The Packers went three-and-out on their first three offensive drives, a span during which Aaron Rodgers went 0 for 2, was sacked twice and fumbled. On the 49ers’ first offensive series, Green Bay lost two starters to injuries: cornerback Sam Shields and outside linebacker Mike Neal, neither of whom were able to return. With the Packers defense twice holding San Francisco to field goals in the first quarter, Rodgers got on track on the fourth drive and helped Green Bay take the lead for the first time after a 14-play, 70-yard drive. Overall, though, McCarthy knew that the Packers didn’t do enough offensively throughout the game. "We knew we needed to score more than 20 points today and I didn’t get that done," McCarthy said. "Defense holds them to 23 points, we should win that game," Rodgers said. Green Bay’s defense forced the only turnover of the game, a first-quarter interception by Tramon Williams that concluded with the veteran cornerback running over Kaepernick, who was attempting to make a tackle. But it was the interception that the Packers didn’t come up with that likely would have been the difference in the game. On the third play of what turned out to be the final drive of the game — one that ended with the 49ers’ game-winning field goal, rookie cornerback Micah Hyde leaped for a pass intended for Anquan Boldin and watched the ball bounce off his hands and onto the cold ground. "It was a catch I should’ve made," Hyde said. "I make those catches all the time in practice. It’s just a difficult catch I should’ve made." While the game certainly wasn’t decided on that play alone, it was the most glaring play that could have changed which team won and which team lost. "We were probably one play away," McCarthy said. "We were one play not good enough." One play away Sunday, a couple plays away in Week 1 earlier this season, many plays away in last year’s playoffs. Whatever the actual number of plays away that the Packers were, Green Bay was bested by a 49ers team with nearly all of the same key players in an NFC matchup that isn’t going to get any easier in the coming years.